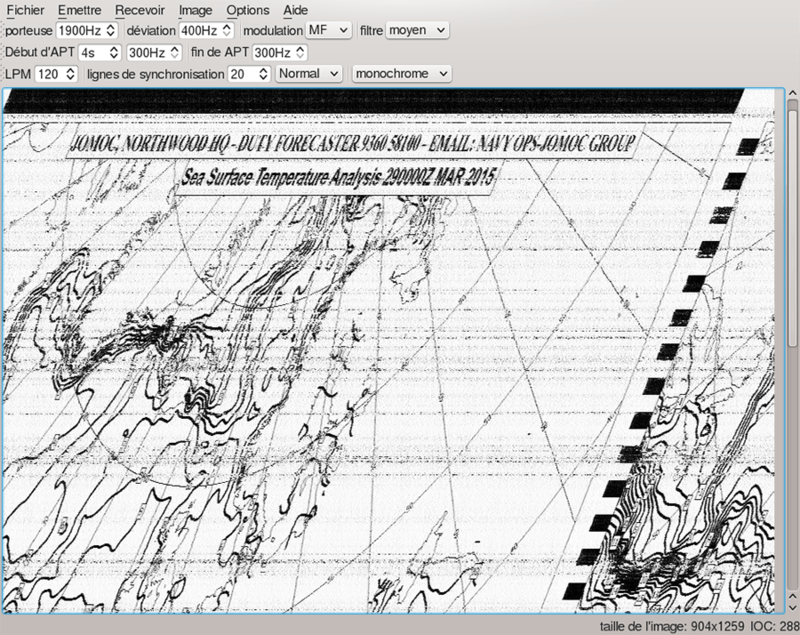 A weather report “fax” sent by ham radio (more examples and details here). I’ve come across your really interesting blog just now as I’m searching for information on weather faxes, weather fax thermal paper. I’m an artist living in Brooklyn, and have a studio in Jersey City. I’m originally from the U.K. and have my General Class HAM radio license. I’m currently working on a project that incorporates SSTV radio transmissions, and QRL cards. I’ve just been accepted to an artist residency in Iceland where I’ll be making long range image transmissions of the melting glaciers I find there. I’ve also made a photo book printed using old thermal fax, which was shortlisted for a prestigious book award. This is a very long winded way of asking if you have the time or interest to meet? I’m beginning to become interested in the idea of transmitting to a radio fax and have it print out my work instead of weather maps? Please let me know if you can meet? Hoboken is so close to my studio in Mana Contemporary! All the best, Lucy Helton.